A view of the Great Gatehouse - Llansteffan Castle . 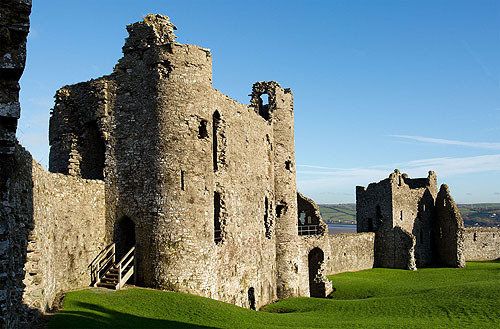 The Castle is on a hilltop overlooking the Tywi Estuary . Originally a Norman earth and timber Castle , built on the site of an Iron Age Fort. The Stone Castle was the work of the de Camville family who held the castle from the late twelfth to the early fourteenth century. With numerous additions and alterations over time , falling into disrepair in the 1500's.